The Pavilion is one of the oldest hotels in Nainital, dates back to the 19th century when it was originally built as a ladies parlor, used as an accommodation for forest rangers, and later a new wing was added to the establishment, which served as a summer retreat for the Nawabs. The British families used to spend months in the cool fresh air and sylvan surroundings of this prestigious hotel The Pavilion. You can still feel the old world charm in this hotel. 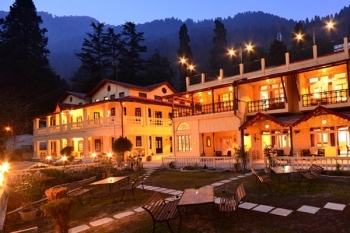 The pavilion is set amidst tall deodar trees at the base of the famous Cheena Peak. The well-maintained gardens and trees add to the peace and tranquility. The hotel has been constantly upgraded and modernized to meet the requirements of tourists and guests. The hotel has its own conference room which is capable of hosting upto 100 persons. There is also have play area for children, an activity room and parking in the hotel premises. Bakers Hut (a cafe) was added recently, with a conference hall with a capacity of 80 people is also available, making it highly convenient for corporate trips as well. 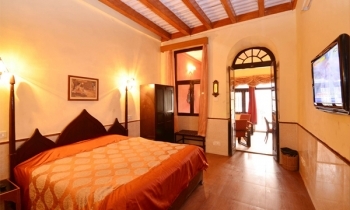 The group has one more hotel in Nainital named: Hotel Himalaya, just in case you are unable to find rooms The Pavilion, you can check with the other hotel located in Tallital. The hotel Pavilion is very conveniently approachable by road and it is located near High Court in Mallital region of the Nainital. The Naini Lake, the Naina Devi temple and the Nainital boat club are at a commutable distance from the resort. There are total 34 rooms in The Pavilion hotel with all the modern facilities and high ceilings with antique furniture and modern amenities. Standard Room: are spacious and have all the amenities of a small friendly hotel, television, telephone, parking etc, and of course each room is ensuite with bath or shower. Balcony Rooms: have attached balconies, are tastefully decorated and comfortable, these rooms have garden view and all the amenities. Heritage Family Suites: are in the heritage wing of the hotel, these rooms are very spacious and have two double rooms with two double bed with either one or two bathrooms. Our rates are for four people. The Pavilion has a multi-cuisine restaurant that offers a wide variety of delicious food. - Family suite consists of 2 bed rooms & 2 washrooms, but the washroom is attached to 1 bedroom. So to go to the washroom from first bedroom, one has to go through the second bedroom. - Welcome Drinks On Arrival (Non Alcoholic), Bed Tea, Breakfast, Dinner on menu plan. - Accomodation On Twin Shairing Basis. The nearest airport to Nainital is Pantnagar Airport situated at a distance of 70 kms. The nearest railhead is situated 34 kms away in Kathgodam. Nainital is well connected by motorable roads with major towns of Uttarakhand and other northern states.